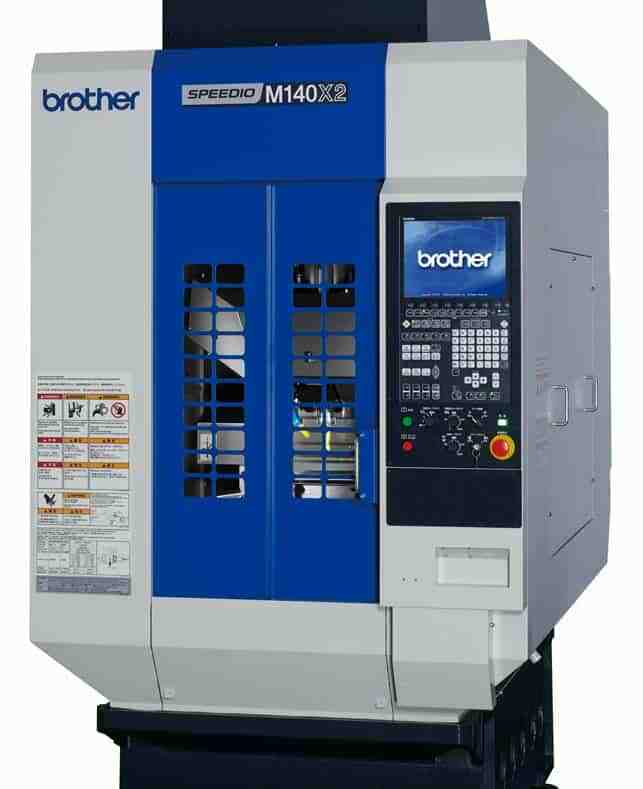 Brother, the Japanese manufacturer of very high speed machining centres, has introduced an uprated version of its Speedio M140X1 5-axis, 30-taper mill-turn centre. Called Speedio M140X2, the machine was launched at Jimtof 2016 last November and is available in the UK and Ireland through sole agent, Whitehouse Machine Tools. Improvements include an integrated, high output, direct drive motor in the C-axis to replace the previous roller drive powering the 2,000 rpm turning table. The A-axis trunnion rotates through a 50 per cent larger angle, from +120 to -30 degrees, allowing machining of features at the rear of components and facilitating loading and unloading of parts at the front of the machine. Furthermore, the A-axis is now tilted by a backlash free roller drive, promoting high accuracy metal cutting. A holding force of 400 Nm without the need for a mechanical clamping mechanism delivers high speed indexing combined with rigidity when milling parts at an angle or turning them in the horizontal plane. A new option is a 16,000 rpm BIG Plus face-and-taper contact spindle, which can 1 be specified in place of the standard 10,000 rpm spindle. X / Y / Z travels of 200 / 440 / 305 mm remain the same, but the distance between the table surface and the spindle nose has beenincreased to 455 mm, providing more space for the fixture, workpiece and cutting tool and hence extending versatility of production. Brother has removed every conceivable element of non-productive time. For example, not only are speeds fast during non cutting motions, but they also take place simultaneously in X, Y, Z, A and C, together with tool change. The spindle motor’s rapid acc/dec and a highly responsive servo control enable a 0.2 second start / stop time. Startup time of the turning table from zero to 2,000 rpm is less than 0.3 second. The specification of the Speedio M140X2 includes 0.9 second tool change from the 22-position magazine, giving 1.4 seconds chip-tochip time. Rapids of 50 m/ min in the linear axes help to minimise non-cutting times further, while 30 m/min cutting feed rate maximises metal removal rate. Synchronised tapping is world-leading at 377 m/ min peripheral tap speed. Accessibility for workpiece transfer is ergonomic and the generous door opening can be automated for high production environments or to automate load / unload. Swarf management measures are comprehensive, as befits a machine that is likely to handle large volumes of aluminium chips. A new, high speed C-00 control completes the package.